Does your productivity ever get railroaded by your desire to find the best possible solution? As you seek the easiest or fastest route to your goal, you may find yourself de-railed entirely. You may get distracted, you may procrastinate, loose your focus, or you may not even know what happened. Whatever the roadblock, following these 12 suggestions can help you increase your productivity and return on investment (ROI) in terms of time. PARA LEER ESTO EN ESPAÑOL, IR AQUÍ. Nearly everyone has times of the day when they are most effective and times when they tend to drag. It's smart to schedule the most critical tasks for your most effective time of the day. The time blocking sheets in the quarterly Blog Well Planner are great for this! If a task doesn't really need to be done, simply make the decision to get rid of it altogether. No guilt. It doesn't support the goal, it's not necessary. 3. Eat the vegetables first. Remember when you were a kid and you couldn't stand eating that certain vegetable? If you were like me, you forced yourself to eat it first, so you could be done with it and enjoy the rest of the meal. Apply this to your work. Do the most unpleasant items first and get them out of the way, so you can enjoy the more pleasant tasks. 4. Set a goal each day (or night). Before you start your work, decide what you want to accomplish that day. This can be even more effective when planned the night before. Once you have a sense of direction, you can spend all your time getting things done! Get our free goal planning sheet here. 5. Separate work from social time. While you're working, log out of social media, turn off the phone / cell phone, and don't check your email. Hang a sign that says, “Do not disturb,” if necessary. You don't have to do this for all your tasks, but at least do it during the more difficult or focus-necessary items. If social media is part of your work, only login when it's time to do that, and turn it off when you're done, so it's not a distraction or a temptation. Again, the time blocking thing really helps! 6. Schedule similar tasks together. Do all your emailing at one time. Make all your phone calls at another. Have one or two set time to check in on social media during the day. Upload all your blog photos or edit your posts all at once. You'll waste less time by doing your work in this fashion. Even if a task might take hours, starting will seem easier if you simply give yourself 30 minutes to get as much done as you can. A time limit seems to help many people concentrate and work better, too. There are many free apps, such as toggl, that can help you with this. For example, if you know you have to write 5 auto responders today or 1000 words for your book, tell yourself that you're not getting up for any reason until you've finished. Regardless of what happens, refuse to stop until you hit your target. 9. Use the Pareto Principle. This principle states that 20% of the actions you could take will provide you with 80% of the benefits. So focus on the tasks that will accomplish the most, or earn the most. Unfortunately, these are frequently the tasks that are not enjoyable (see #3). Is there anyone else who can help you? Chris Ducker, in his book Virtual Freedom, explains how there are 4 levels of tasks in any business, I highly recommend reading his book to find out what and how to outsource. It can make a huge difference in your overall productivity. Having a specific endpoint will really help to focus your time and energy. For extra hard tasks, Michael Hyatt recommends that you make a list of why it is important to get this done, and what is at stake if you don't finish or meet the deadline. It may sound silly, but this can really help. Try doing everything a little faster. Walk faster, talk faster, type faster, and read faster. 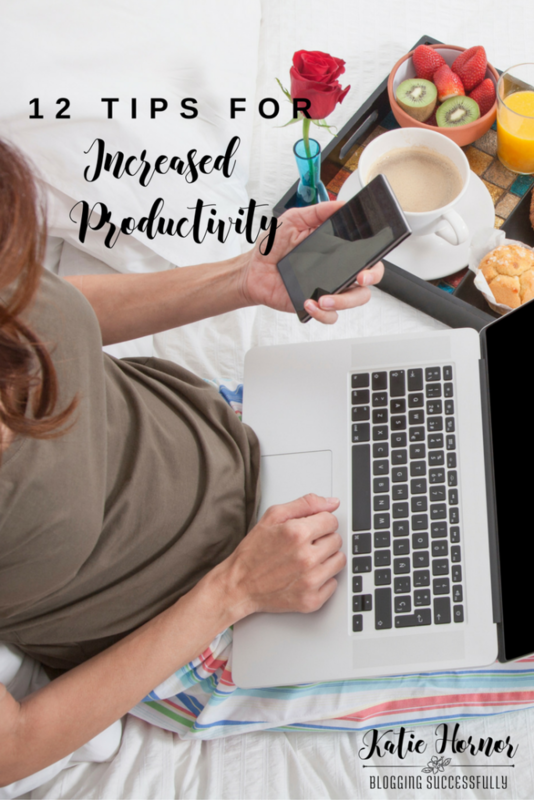 Do you want to get more done in less time and increase your productivity? Ultimately, the secret is to do whatever necessary to stay on task and not waste time. These working tips will help you stay on the fast track to get more done. Do you have another tip for increased productivity? We'd love to hear it. Please leave us a comment. These tips are so helpful! I will definitely use these bc I’m terrible with time management! Destini, So glad they were helpful to you. Let me know how it goes!